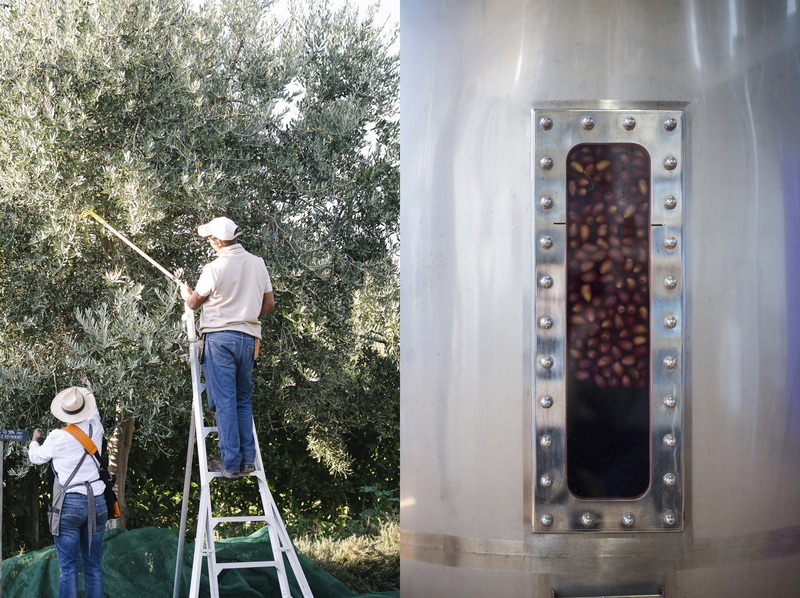 On the farm we use most of our olives to make extra virgin olive oil – a medium style, but complex blend of five cultivars: Frantoio, Mission, Don Carlou, Leccino and Corratina. 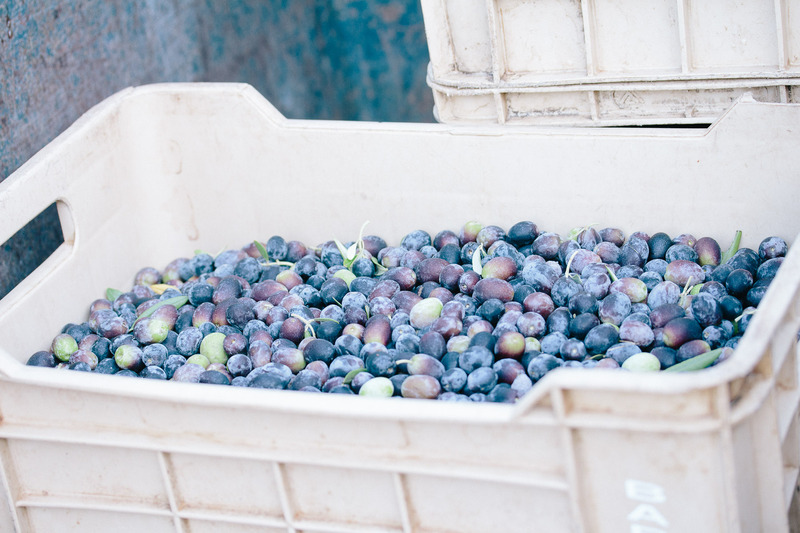 We also preserve the whole fruits in brine or salt for the two restaurants, black calamata and green Nonchellara olives. Olive trees are still covered with black fruits at the moment, and you too can boast with your very own preserved olives – all it takes is a bit of handiwork and patience. The process is simple and the end product well worth the wait. To preserve its characteristic fruity and slightly bitter taste, olives can be pickled or dried. Key to the process is salt, which draws out some of the fruit’s pungent bitterness and unlocks its best flavour qualities. Important to remember: All olive varieties start off green and turn black as they ripen. Green olives are harvested when the fruits have reached full size, but before it darkens in colour. These will have a more zesty taste whereas ripened black olives are softer on the palate with a full-bodied taste. Here’s how we preserve our olives in brine. Add 1kg salt to 10 litres of water (1:10) and mix to dissolve. To test if it’s sufficiently salty, make a solution of 5%, 7% and 10% by adding 50g, 60g and 100g of salt to a litre water. Then add a raw egg and determine how much of the egg is visible above the surface of the water in each solution. Put the same egg in the olive brine to determine the salt concentration. If it sinks, more salt should be added to the water. Continue checking and stirring the olives regularly. The salt level needs to be maintained at 10% throughout the process. If the salt level drops below 6% there is a chance of spoilage. *A white layer of yeast might form on top of the water. This just shows that fermentation is taking place, so nothing to be concerned about. Pickled olives are old favourites on tapas boards and salads, but our chefs combine it with chocolate! Try the dark chocolate terrine with olives and walnuts from the Babel cookbook. If preserving in brine sounds like too much work, you can always preserve your olives in salt. Liesl shows you how. I have just bought fresh olives and I rinsed then in water and they are now in10 per cent salt. My olives seem to have a white dusty mould on them. How do I clean them? Dear Cathy, thank you so much for your question. The white layer that forms on top of the olives are normally a sign that fermentation are taking place. It is a good sign. What you can do is to take a sieve and just scoop it from the top. Remember to ensure that your container is always full to the top with 10% salt solution and use something to keep the olives under the water. As soon as the olives will be in contact with direct oxygen it will turn brown. Hi Terry, the answer from our olive oil maker – It is important to measure your salt solution regularly and adjust to 10%. When ageing the olives the brine must have a 10% salt concentration. Also you need to keep the olives under the water all the time to prevent the olives from oxidizing and turning brown. Most reasons for the brown colour is when your green olives are in contact with air. Place a plastic lid on top of the olives with something heavy on top to keep the olives down. Have followed the first steps and have the loves in the brine with oil on top. How long will it take to preserve – ie before ready to eat? Do I need to put fresh brine in? Or just add salt every so often? Hi Ruth, our olive man answers the following: Is it green or black olives? If it is a small volume like 10li bucket the easiest will be to replace the brine every 2 months. Then you know the solution will be 10%. If the volume gets bigger it is good to buy a salt refractometer. At 10% brine the olives can stay in the container (container must be full and olives submerged under water all the time) for 12 – 18 months. You can start tasting it from 6 months, but we age for 12 – 18 months in 10 % salt solution. It should take 2 – 3 months before they are ready to eat from the stage you have them at now. However, I’ve left my olives for up to a year (*) before I opened them and they were DELICIOUS! If you’re doing this for the first time, I’d recommend to open a jar about one month into the bottling stage to taste – I’m not a fan of the bitterness of “youngly preserved” olives at all, but that is just personal preference – many love it. The longer you leave them, the milder they get. Hope this helps! *That is, if you have made use of sterilised jars and lids, filled them RIGHT up to the top, sealed them very tightly, and kept them in a cool, dark place. How do I measure my salt solution to continuously be at 10%? I have now started with a 1kg salt/ 10l water solution and placed freshly picked olives in a bucket. Dear Hentie, if it is a small volume like a 10 liter bucket, the easiest will be to replace the brine every 2 months. Then you know the solution will be 10%. If the volume gets bigger it is good to buy a salt refractometer. Hi I have brined my olives until the bitterness has gone. What now? Can I bottle them in olive oil with flavourents? How long will they last in olive oil or is it better to store them in vinegar with spices? Dear Suzie – we normally keep our olives in the 10% brine for 1 year. 4 days are too short. You can taste them after 6 months and then decide if it is good enough. Remember to keep the olives submerged in the brine and the containers must be filled to the top. Hope this helps! I have bribed my olives in a lemon, garlic, salt and spice mix. They have a great taste…my question is what do I do with them now so they are preserved? Hi please can you help me? I have now taken my olives out of the brine solution after 8 months and am ready to bottle them. How do I make up a 6% solution of brine (ratio of salt to water please)? Hello Peta, mix 1 litre water with 60gram salt (6% saltwater) plus 250ml vinegar. Can I use your olive oil for high heat cooking? Hi Annette, yes, olive oil is perfect for high heat cooking.